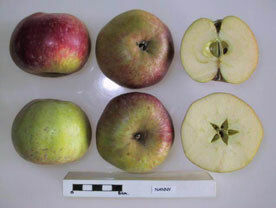 The Nanny apple variety was first grown in either West Sussex or Surrey and recorded as a variety in 1842. It is currently cultivated as part of Brighton Permaculture Trust’s -:- National Collection in Stanmer Park, Brighton. You can see a Nanny apple tree (planted 2009) in Home Farm Orchard, Stanmer Park ( map). The Nanny is a large apple, flat-conic in shape, it is slightly ribbed on the body of the fruit. The skin is pale yellow and covered with orange flush, dark red stripes and russet dots. It is sweet with a rich flavour but soon becomes mealy. The Nanny apple is a vigorous, upright-growing tree.